I hope you have had a good Easter and are all suitably stuffed full of Chocolate. Whilst you’ve been eating, I have been out running because I am training for the London Marathon which is now just three weeks away. I’m looking for some good running tunes to listen to on my way round the 26.2 mile course, so if you have any suggestions let me know in the comment box below. Also if you are taking part in a sporting competition or challenge let me know and I can give you a shout out on the show! Right run done, it must be time for Chocolate! 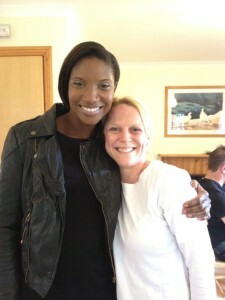 Here’s me getting some advice and a cuddle from Olympian Denise Lewis!